If hurling has owned the summer then there is the temptation to claim that the Premier League is back this week to take its place as sport’s number one attraction. Some of us can sit back and enjoy all sports. I know Ken McGrath is a fellow county man, and I know how much his sport means to him, but his comments last week are at the heart of the problem with Irish sport. Why can’t we all just get along? Why do we have to choose one over the other? It has been a great summer of sport. We had a brilliant World Cup – sadly without Ireland, our ladies’ hockey side have deservedly enjoyed the limelight and of course the hurling championship has been absolutely sensational. Last weekend’s games were amazing and gripped the nation. I don’t understand why some people believe that one sport has to be better than another in Ireland. It’s a mentality that puzzles me. It is at the heart of the problem in this country and this is why we had the ugly back-drop and unnecessary tension around the Liam Miller testimonial match. I am looking forward to the start of the new Premier League season as much as I am looking forward to the climax of an epic GAA season. One man who does not look full of eager anticipation for the start of a new campaign is Jose Mourinho. But if he is so unhappy why doesn’t he just walk away from Manchester United? I am certain that most of the sullen grumpiness we have seen on their pre-season tour of the United States is for show. I am just not certain anybody is really bothered anymore. Mourinho is still a master tactician and when he gets his team right, he remains one of the most difficult managers in the world to beat. But the game has moved on. He was appointed at the same time as Pep Guardiola. Look at the signings they have made since. Look at the gulf between them – 19 points separated their clubs at the end of last season. No one is asking Mourinho to be like Jurgen Klopp every day and put on a false persona for the fans and smile all the time. But he is not doing himself or Manchester United any favours with his behaviour. The eve of a new season is a time when we expect everyone to be optimistic and full of enthusiasm. Mourinho just looks miserable. 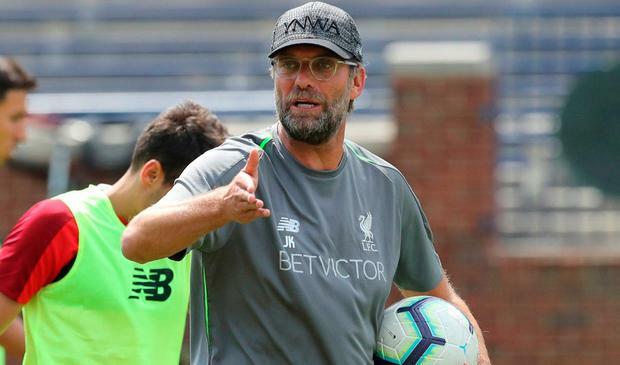 He has been moaning about the lack of signings, despite spending more than £300m since he arrived at Old Trafford three years ago, and he has been urging certain players to curtail their summer holidays to prepare for the new season. Some have returned – but let’s face it, Phil Jones needs all the help he can get and, like Marcus Rashford, he hardly played at the World Cup. The dig was clearly aimed at Paul Pogba. Pogba’s performances at the World Cup demonstrated he can be a world-class footballer but, for whatever reason, Mourinho doesn’t rate him or can’t accommodate him in his team and get the best out of him regularly. I can’t see Pogba cutting his holidays short. And I can’t see Mourinho lasting the season. One of the major problems, of course, is the resurgence of their noisy neighbours, Manchester City. And it is hard not to see the champions going from strength to strength under Guardiola this season. With his sheer presence and reputation, the demands he obviously places on his players all the time and the money he has available to strengthen a team which ran away with the title last season, Guardiola will have his eye on the big prize again. The rest of the top six have to try to bridge an enormous gap, although I expect City to have a sluggish start as their players return late after their exertions in Russia. Of course, this is going to be an issue for a lot of teams, and those with smaller squads will be hit hard. Leicester City, for example, who will kick off the new season at Old Trafford on Friday night, had 10 players on World Cup duty. Chelsea were clearly not happy with Antonio Conte last season, even though he had just won the Premier League title in his first year, and it will be interesting to see what impact Maurizio Sarri makes at Stamford Bridge. But Sarri’s fate could be decided by the transfer window. What are his chances of competing for the title if Eden Hazard leaves Chelsea? Can they replace him in the time remaining? Tottenham have also been slow in the summer transfer market (again) and it could prove difficult to remain ahead of Arsenal, and the rest of London, with the move to their new stadium to fund and players like Harry Kane and Dele Alli certain to be jaded after their summer adventures. They do have a very good record in the transfer market, though. Look at the performances of Kieran Trippier in Russia. You’d be a fool to write Mauricio Pochettino’s team off, but Spurs certainly enjoy making life difficult for themselves. As for Arsenal, it would not surprise me if they are top and unbeaten at the end of October. The players will enjoy working with a new manager and taking a different approach. I expect to see a very different Arsenal – aggressive, well organised, more robust and able to handle the games against the big boys. And then lastly, of the title contenders and hopefuls, there is Liverpool. Will this finally be their season and can they lift the Premier League trophy for the first time? There has certainly been a great deal of euphoria among Liverpool fans after their summer business, particularly over the purchase of Brazilian goalkeeper Alisson. Their cruel treatment of Loris Karius is very unedifying but seems typical of the way some modern-day fans and keyboard warriors want to interact on social media. Alisson will be under pressure to perform and he can look forward to any mistakes he makes being scrutinised and criticised. And that’s just from Liverpool supporters! It piles the pressure on Klopp too. He has spent more than £250m to compete with Manchester City and win the league at last. Still, whether he succeeds or fails, at least we know he will be smiling.